Combine flour, sugar, salt, water and shortening in the bowl of an electric mixer fitted with a paddle attachment. Mix on low speed until ingredients are well combined and dough is smooth. Divide the dough into 2 pieces. Press each piece out to form a 6-inch disk and wrap them in plastic wrap. Refrigerate the dough for at least one hour or for up to 1 week. Pie dough may be frozen, wrapped in plastic and then in aluminum foil for up to 3 months. Defrost in refrigerator before rolling out. Preheat oven to 375 degrees. Butter bottom and sides of 9-inch pie pan. Turn the chilled dough out on a lightly floured surface and sprinkle it with a little flour. With a lightly-floured rolling pin, roll the dough out to form a 13-inch round about 1/8 inch thick, rotating the dough as you roll it and occasionally sliding a flat metal spatula underneath to make sure it does not stick to the surface. Lift the dough by folding it in half over the rolling pin, and gently place it on top of the prepared pie pan. Press the dough firmly against the bottom and sides of the pan; be careful not to stretch the dough, or the tart shell will shrink as it bakes. Trim the crust at the edge of the pan. Prick the bottom and sides of the crust with a fork. Cut out a 12 x 12 inch square of parchment paper. Crumple the parchment; then open it up and grease one side of the paper with vegetable shortening. Place the greased side down on the crust, and add pie weights or dried beans to fill the bottom and a little up the sides. Remove the pie pan from the oven and carefully lift out the paper and beans. If the crust tears, patch it by pressing it together with your fingers. Bake crust for another 10 minutes, until brown and remove from oven. It is not necessary to wait for the crust to cool before filling it. In a large mixing bowl, beat the eggs, egg yolks, and vanilla together lightly. Stir in the salt, sugar, cinnamon, ginger, cloves and 1 cup of the heavy cream until well blended. Stir in the pumpkin. Pour mixture into prebaked pie shell. Bake until a toothpick inserted in the center comes out clean, about 1 hour. Do not jiggle the pie while baking. 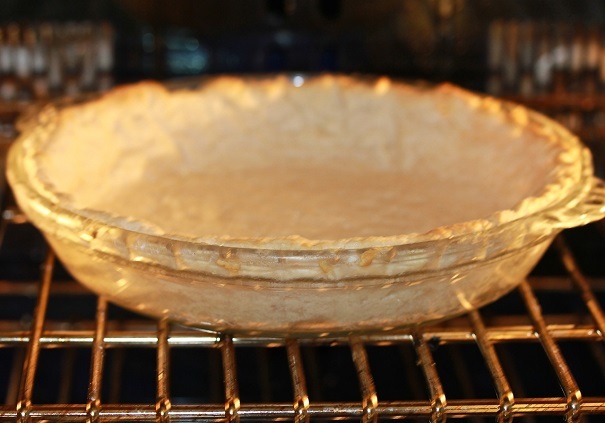 Allow pie to cool on a wire rack, then refrigerate uncovered for up to 3 days. 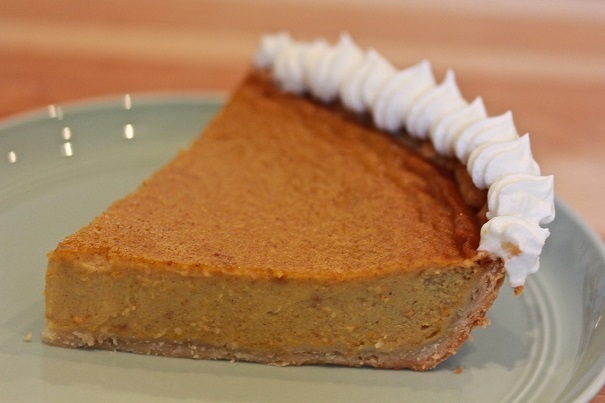 When ready to serve the pie, whip the remaining heavy cream with the confectioners’ sugar in an electric mixer until it hold stiff peaks. Pipe whipped cream around edge of the pie, and decorate with candied ginger.